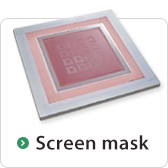 Screen mask is the original plate used in the screen printing process, which is essential in the production of electronics products. In combination of frame, screen mesh and high quality in-house developed emulsion, we can provide a variety of screen masks to satisfy customer requirements. [Main applications: ]Printing of touch panel wiring, inductors, solar cell finger electrodes, high frequency parts, etc. *(1)The smallest possible line varies, depending on mesh, emulsion thickness and image area, etc. Please contact us for details. *(2)Varies depending on emulsion thickness, paste, etc. TOPRO provides high tension screen mesh combined with various processing options, for excellent initial dimensions precision, and durable specifications. *Achievable precision varies depending on substrates, options and the plate used. Excellent surface smoothness, and prevents printing deterioration at low thickness of emulsion. *Handles wire diameters under 25µm. Please contact us about 25µm or higher wire diameters. Enables printing with reduced thickness of mesh and emulsion, thinner printing and reduced saddle phenomena. [Recommended mesh:]Low mesh such as ST70, ST100, etc. High precision plates are available for bulk patterning in large area of pattern printing. Solid plates can achieve uniform coating for solid printing. In combination with the options processing to achieve higher accuracy and additional functions. 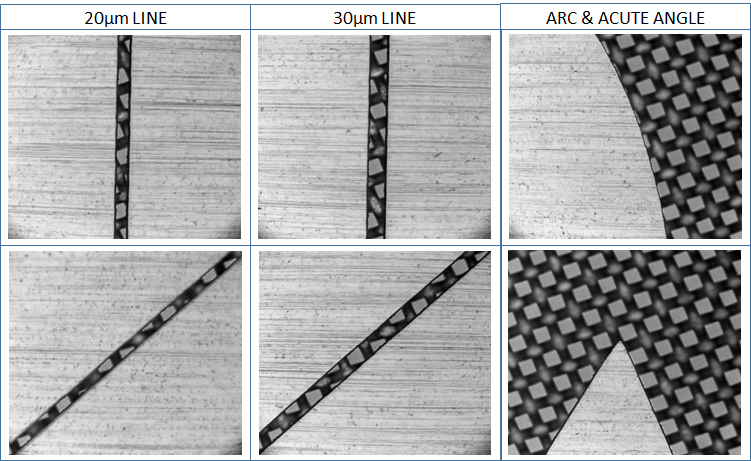 [Main applications:]For large display lines using EL seal printing, EL drying agents, etc. [Recommended mesh:]Wide mesh such as ST325, ST400, etc. 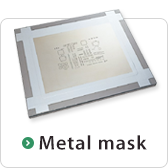 NE Mask is called a Metal Screen Mask that Nickel foil is substituted for emulsion on screen mask. Pitch width: 32.5mm, 25marks in total. Total pitch width: 130mm/one side Error range in all 25 marks at initial stage precision is within ±5μm. *The precision can be changed by strength and /or tension of mesh. 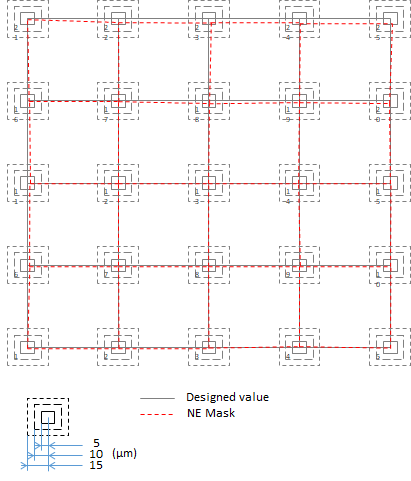 Pitch precision of NE Mask hardly changes after 10,000 shots for printing. 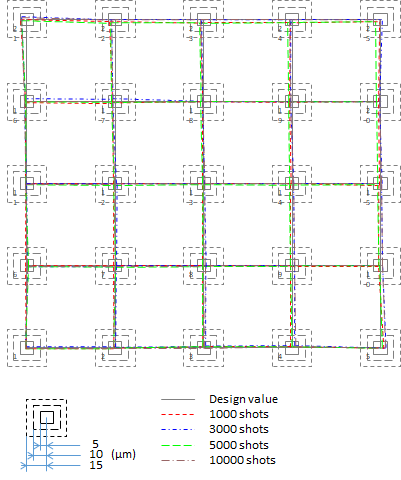 Screen Mesh thickness: Basically, applicable to almost all types of meshes. *For some particular law meshes like 200mesh or less – pasted plating thickness is R5 or above. *Except 200mesh or less of law meshes and 30㎛ or above of metal thickness. Please contact us about any other specifications. MS Mask can freely design number of threads per inch , diameter of a thread and thickness of screen unlike Non Emulsion masks that consists of meshes on the market. 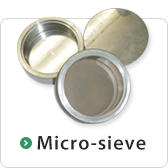 It is possible that Ultra-thin printing and hyperfine line printing would be provided by Micro sieve. That cannot be made by Screen mask. Also, MS Mask solves a pitch width problem that is happened to Screen Mask. *For any other specifications , please contact us. *Note1: Available area – in case of the specification based on opening width precision is within ± 1μ. Pitch width: 37.5mm , 16 marks in total. Total pitch width: 150mm /one side Error Range in all 16 marks at initial stage precision is within ±5μm. *The Precision can be changed by strength and/or tension of mesh. Pitch precision of MS Mask hardly changes after 10,000 shots for printing. Plain weave meshes made of reliable stainless-steel wire with excellent printability. Available in various types from 70-mesh screens for thick film printing up to calendered 730-mesh screens for fine pitch patterns. Adjustment of discharge by calendering process. Cost-effective screen with a higher modulus of elasticity. 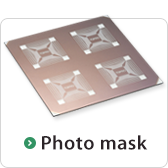 Widely preferred screen for a wide range of applications such as PCB, FPC and membrane sheets. Metal coating fixes the mesh structure and keeps the elongation of a screen to a minimum, improving significantly the image size accuracy. Ideal for applications in which ultimate image accuracy is of prime importance. More detailed adjustment of discharge by controlling plating thickness. The wire material used for high-tension stainless-steel screens has a tensile strength three times greater than conventional stainless-steel wire, showing no more than one-eighth of the usual elongation. ※Refer to graph SX230, SX300 as below. Such properties of the wire material allow ultra-thin wires to be used, thus realizing meshes with a high open area percentage – ideal for fine-pitch pattern printing. Even high-viscosity paste can be printed easily with low pressure, giving outstanding image accuracy in pattern printing. Twill can also be ordered. NOA Standard emulsion of TOPRO. Our emulsions offer excellent stencil resolution, abrasion resistance and solvent resistance. High solvent resistance that resistance to polar solvent like N-methyl-2-pyrrolidinone. Minimized cracking such as at the corners of alumina boards. Excellent stencil resolution, and it suppresses the blurring of MLCC paste. Excellent abrasion resistance with its softness. In combination with the BK processing (fluorine coat processing) to suppress blurring. NEX-S For solar cell printing. Good passing property of the paste due to its fine stencil constituent particles with weak releasability. High resolution screen printing can be obtained because it prevents the leakage of paste at the backside of the stencil with its softness. *Further special emulsions are also available for individual applications. Please enquire. 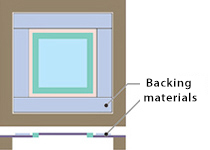 In this construction, a steel wire mesh is suspended on a supporting polyester mesh. Thus the advantages of both elastic polyester mesh and stable steel wire mesh are combined. The stability of supporting mesh is reinforced by backing materials, which improves the reliability of combination-meshed screens. It contributes to dimensional stability. It reduces the damage during printing. Fluorine application on the emulsion surface to have hydro and oil repellency. 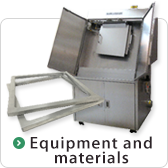 Screen frames play a vital role in screen printing. As the dimensional accuracy and the correct screen tensioning are essential for the quality of high-precision screen printing, it is important to select the right frames for the accuracy and strength of the construction. © TOKYO PROCESS SERVICE CO., LTD.